Is This Bull Market Finished? By Mark McClanahan | 1 year ago It's been on a great run. But all good things must come to an end. By D Magazine | 1 year ago Out of the 50 that applied, 25 firms and teams were selected. By Zac Crain | 1 year ago When veteran sailor Conrad Callicoatte drowned in tiny White Rock, his friends and neighbors were mystified. Especially the ones who didn’t know he sailed. By Eve Hill-Agnus | 1 year ago The cozy Bishop Arts staple knows how to make its guests feel right at home. By Eve Hill-Agnus | 1 year ago You could be predictable and simply show up with a bottle of Chard or a bouquet of flowers. Or you could make an impression with a gift as pretty as it is delicious. By Kathy Wise | 1 year ago Esthetician Jeanna Doyle is helping women with cancer understand their options, whether they want to get a new 'do or embrace baldness. By S. Holland Murphy and Megan Ziots | 1 year ago Nine group outings worth leaving the hearth this season, including a Wizard of Oz-themed pumpkin patch and family karaoke. By Stacy Girard | 1 year ago Only North Texas' most elite socialites make it on the list of the mysterious new Dallas Social Register. 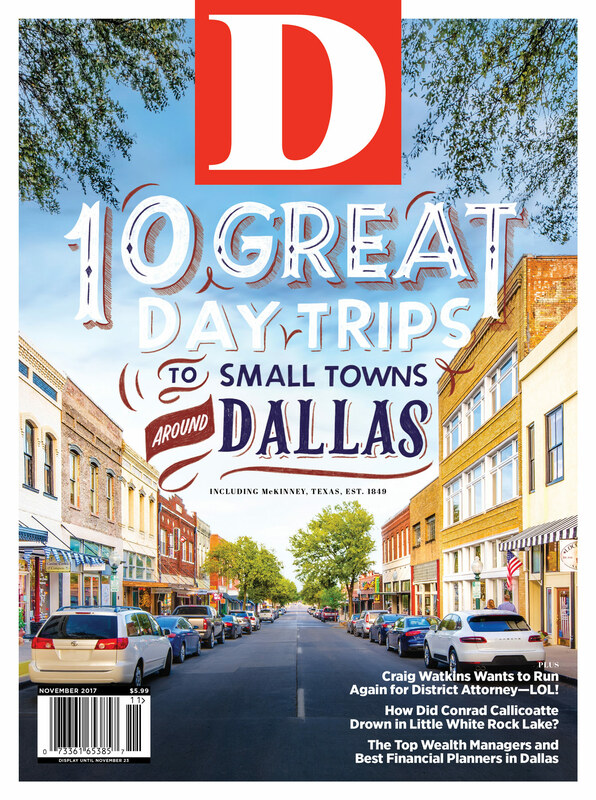 By Eve Hill-Agnus | 1 year ago CBD Provisions is still exactly what downtown needs. Which All-Natural Dallas Nail Salon Is Right for You? By Caitlin Clark | 1 year ago Pink Pedi and Vivian's Boutique Spa both offer toxic-free services and locally made products. We took a look at what sets them apart. By Catherine Downes | 1 year ago The charcuterie boards at the Deep Ellum gastropub bristle with meats and in-house ingredients. By Caitlin Clark | 1 year ago Courtney Akai, the celebrity diva of New York eyelash extensions, quietly opens a second location in Preston Center. By Alaena Hostetter | 1 year ago The Dallas songwriter's new gospel of ambitious country music has won him devotees in North Texas and beyond. By Caitlin Clark | 1 year ago BAM Beauty Bar blows out a familiar salon concept. By Eve Hill-Agnus | 1 year ago The grand old downtown hotel unveils its secret culinary weapon. By Eric Celeste | 1 year ago He was the Dallas district attorney for eight years. He was a hero. Then a string of scandals cost him the office. Still—dismiss him at your own risk. By Alice Laussade | 1 year ago Downtown's Don't Tell is not nearly as risqué as you've been led to believe, unless you're scandalized by the sight of one of the One Direction kids spinning fire. By Tara Nieuwesteeg | 1 year ago At first glance, the Old East Dallas icehouse may seem a bit gritty. But live a little and try the moonshine. By Kathy Wise | 2 years ago We're rooting for Elliott to grow up and be a better man. By Peter Simek | 2 years ago The new museum at Encore Park offers a lens into the city's often forgotten history, and into its often overlooked contemporary troubles.